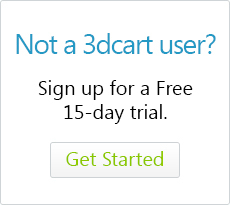 How Do I Add Zip Pay To My 3dcart Store? Configure the rest of the Payment module's regional, order amount and customer group settings as needed. Click "Add New" to add the module. At this point, the module is added to the store, but you will still need to enter your credentials for it. This is the label that is shown for the payment method. By default it will say "Online Credit Card" but you may change it as needed by clicking on the pencil icon. When marked, this checkbox will put the module into test mode which allows you to use a credit card to connect to the gateway, but not actually charge the credit card. Just remember to unmark the checkbox when you're ready to take live transactions! The combination of Merchant ID and API Signature keys will identify whether you are using Zip Pay or Zip Money. This will be listed in the "Detected Product" section. The refresh button can be used if in order to re-detect the applicable Zip Pay/Zip Money product. Once you have entered your applicable credentials, click on the "Save" button located at the top right of the page. Your payment method is now added to the store and ready for use.